Boston-based Liberty Mutual is offering discounts to customers who install “smart” smoke detectors and agree to share the data. Insurance companies are tapping into the onboard computers of automobiles to monitor how customers drive and setting car insurance premiums based on that information. Now, they want to do the same thing in Internet-connected homes. Boston-based Liberty Mutual and American Family Insurance Co. of Madison, Wis., last week began offering discounts in a handful of states to customers who install wireless smoke and carbon monoxide detectors and agree to share data from the devices with insurers. The companies have partnered with Nest, the home automation unit of Google Inc., to provide the service. The move, analysts say, signals an evolution in the use of personal data to price insurance and raises new questions about privacy in an age when more devices — from televisions to refrigerators — are collecting information on their users. “This is the next phase in insurance,” said Laura Adams, a senior insurance analyst with the consumer website Insurancequotes.com. The day's top stories delivered every morning. Insurance companies have initially targeted fire prevention devices because fire claims are the largest category of homeowner insurance losses, accounting for about 30 percent of all losses, according to the Insurance Information Institute, a New York-based industry research group. Fire was responsible for $19 billion in property losses in the United States in 2013. The smoke and carbon monoxide detectors will wirelessly transmit data about their status to Nest, which will inform Liberty Mutual each month whether the smoke and carbon monoxide detectors have batteries, they are properly charged, the sensors are working, and the Wi-Fi connection is good. Customers who participate in the program will receive at least 5 percent discounts on their home insurance. For a consumer paying the national average premium of $1,034 annually, the savings would be about $52. 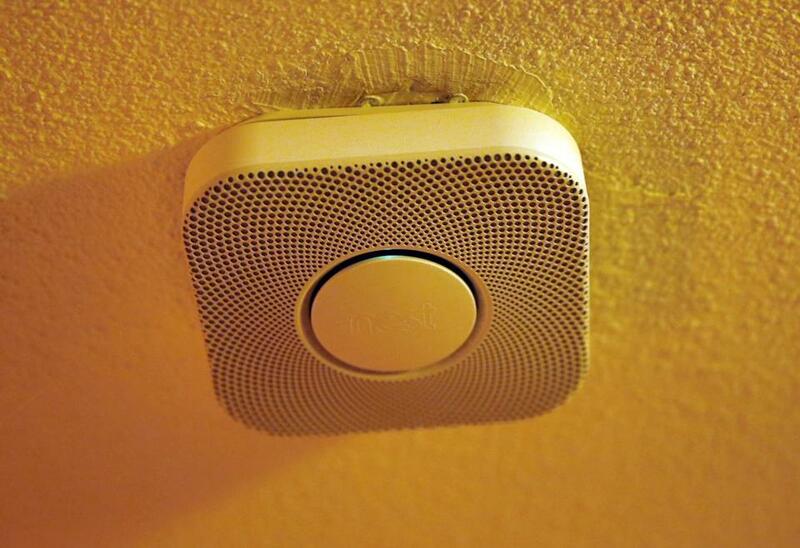 The program could help consumers by warning them, for example, if their smoke alarms are not working. But insurance companies also benefit by collecting data on consumer behavior that allows them to identify higher risks, such as customers who don’t keep their smoke alarms in working order, and determine how much to charge for insurance, said Birny Birnbaum, executive director at the Center for Economic Justice, a Texas consumer group focused on the insurance industry. Insurance companies have been mining personal data to set rates for decades, which includes the controversial use of credit scores as a predictor of whether homeowners or drivers are riskier bets. But the modern home, which includes an array of so-called smart devices connected by the Internet, could provide a trove of information about personal behavior for insurers. Nest and other companies have introduced devices — from smart thermostats that turn themselves down when no one is home to door locks remotely controlled by cellphones — that could eventually provide data useful to insurance companies, industry experts and consumer advocates said. Such devices, for example, could tell insurers whether customers always lock garages and doors or if they often leave for weeks at a time, posing greater risks of theft. Liberty Mutual, like many insurers, already offers drivers a chance to save hundreds of dollars on auto insurance if they install a device in their car that tracks how far they drive, when they are on the road, and how often they step on the brakes — a telltale sign of tailgating, which increases the risk of accidents. The information from the gadget is wirelessly transmitted to the insurers. The product was initially introduced as a way for good drivers to save money, but some companies have started using it to penalize drivers whose devices indicate they brake sharply often, speed, or drive late at night, which indicate they are more likely to get into accidents. Insurance companies have been using data collected from cars for the past five years, Birnbaum said. As drivers become more comfortable with these data-transmitting gadgets, industry analysts expect the market for them will grow to more than 100 million users globally in 2018 from 5.5 million at the end of 2013. It’s too early to say whether homeowners will embrace sharing information about their home lives to lower premiums, analysts said. But as smart devices that compile data become more common, Birnbaum said, states need to adopt stronger laws to ensure companies are protecting the information from cyberattacks and using it appropriately. Companies should be restricted from sharing the data with other firms that want to sell consumers other products. They also shouldn’t be allowed to use the information to fight paying claims, Birnbaum said. “There is a crying need for regulators at this big data era to set up some ground rules,” he said. Deirdre Fernandes can be reached at deirdre.fernandes@globe.com. Follow her on Twitter @fernandesglobe. Real journalists. Real journalism. Subscribe to The Boston Globe today.